The Pinnacle FLEX XC3401 Natural Brilliance Kit combines science and nature in harmony! Complete paint correction and wax kit. The Pinnacle FLEX XC3401 Natural Brilliance Kit brings out your vehicle's true potential with naturally derived products and the power of the FLEX XC3401 VRG Orbital Polisher. This polish-wax-maintain kit restores the brilliance to all types of paint by eliminating imperfections and sealing the paint under a glossy coat of premium liquid wax. 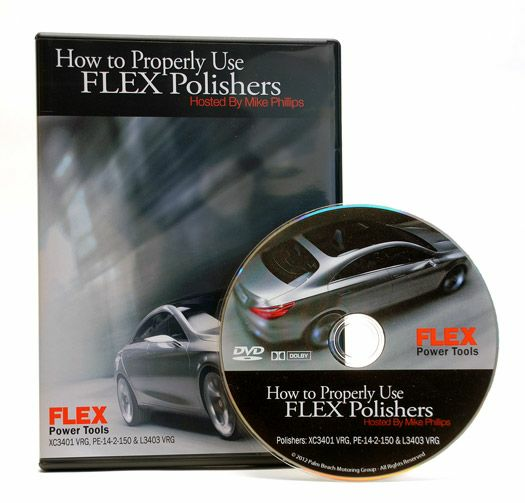 The orbital rotation of the FLEX Polisher simulates the circular movement of the human hand while polishing. This motion is less likely to cause holograms than a rotary buffer. At the same time, the polisher's highly smooth running facilitates a careful, precise finish and allows for hologram-free polishing. The positive drive ensures a uniform movement, even under load, thanks to constant lift. Taken in conjunction with the large stroke length, the FLEX can remove existing holograms from black finishes. The large stroke length refers to the size of the orbit. On many dual action polishers, this is a very small distance and therefore you feel a jiggling motion. On the FLEX polisher, the stroke length is 8 mm, a huge distance in terms of orbital polishers! 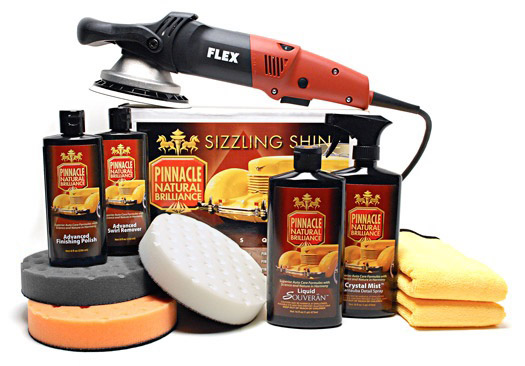 The FLEX Dual-Action Polisher has a true dual action motion that reduces vibration. The FLEX Orbital Polisher�s smooth acceleration and uniform, controlled motion make this DA machine ideal for novices and pros alike. The FLEX XC3401 dual action polisher comes with a 5.5 Inch Hook & Loop Backing Plate and a 1 year manufacturer warranty. Natural carnauba wax gives Crystal Mist Carnauba Detail Spray its distinctive, wet-looking shine. Carnauba, combined with crystalline polymers, creates sharp reflections and silky paint. This state-of-the-art carnauba-polymer matrix also enables Crystal Mist to bond to the existing wax for an instant but long-lasting gloss. On top of Liquid Souveran� Wax, Crystal Mist reactivates the existing wax so you�re not just seeing a surface gloss � you�re seeing the depth and dimension of multiple layers of carnauba. Firm, high density foam for scratch and defect removal. Use this pad with polishes and swirl removers. It�s an all around pad that will work on most light to moderate imperfections. Apply Pinnacle Advanced Swirl Remover with the orange light cutting pad. This black foam pad has soft composition for applying glaze, finishing polish, sealants, and liquid waxes. The soft pad has no cut, making it perfect for applying nonabrasive products evenly. Apply Pinnacle Liquid Souveran� Wax with this pad. A total retail value of $628.90. Save $118.91! First time to website, first time buyer. Great sales price. Very good delivery service. Might be overkill for home owner but when I break it open I know it will be worth every penny.